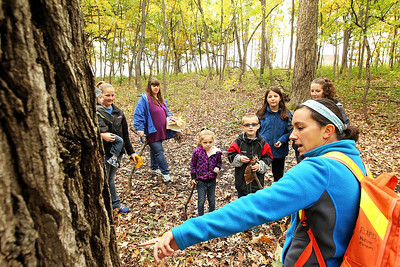 Candace H. Johnson-For Shaw Media Christine Kustra, recreation supervisor, takes a group on a nature hike through Hart's Woods and points out a burr oak tree during the Oaktober Celebration at the Round Lake Area Park District’s Aquatic Center and Nature Museum in Round Lake. 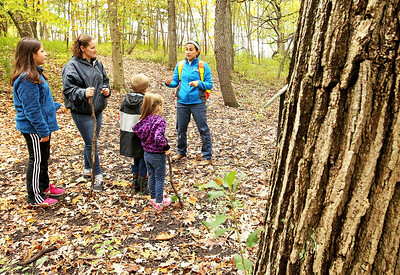 Candace H. Johnson-For Shaw Media Christine Kustra, recreation supervisor, takes a group on a nature hike through Hart's Woods during the Oaktober Celebration at the Round Lake Area Park District’s Aquatic Center and Nature Museum in Round Lake. 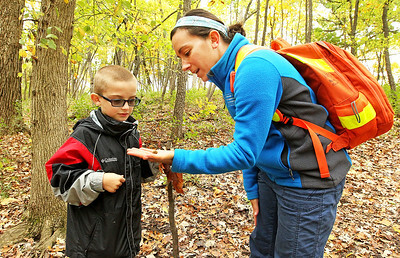 Candace H. Johnson-For Shaw Media Logan Carey, 7, of Round Lake talks to Christine Kustra, recreation supervisor, about the white acorn she is holding that they found on their nature hike through Hart's Woods during the Oaktober Celebration at the Round Lake Area Park District’s Aquatic Center and Nature Museum in Round Lake. 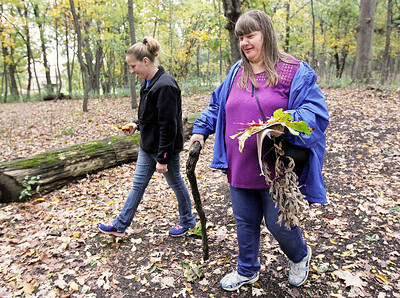 Candace H. Johnson-For Shaw Media Ashley Carey and her mother, Denise, both of Round Lake go on a nature hike through Hart's Woods during the Oaktober Celebration at the Round Lake Area Park District’s Aquatic Center and Nature Museum in Round Lake. Denise Carey found a walking stick in the woods and left it behind for the next person. 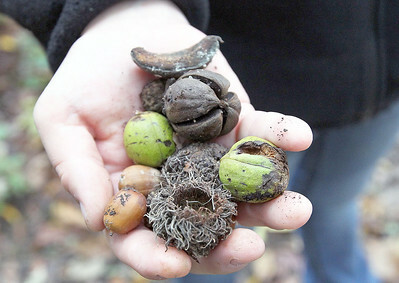 Candace H. Johnson-For Shaw Media Ashley Carey, of Round Lake shows off a burr oak tree cap, an acorn nut and a shag bark nut she found on a nature hike in Hart's Woods during the Oaktober Celebration at the Round Lake Area Park District’s Aquatic Center and Nature Museum in Round Lake. 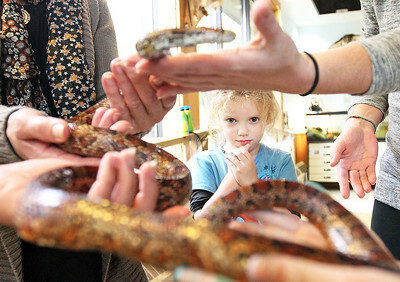 Candace H. Johnson-For Shaw Media Lana Kustra, 5, of Cary decides whether she wants to touch, Pudding, a corn snake, during the Oaktober Celebration at the Round Lake Area Park District’s Aquatic Center and Prairie Grass Nature Museum in Round Lake. 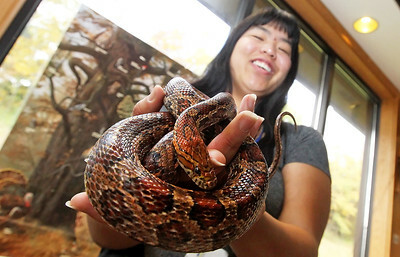 Candace H. Johnson-For Shaw Media Rachel Castillo, educator, holds a corn snake named, Pudding, during the Oaktober Celebration at the Prairie Grass Nature Museum in the Round Lake Area Park District's Aquatic Center building in Round Lake. 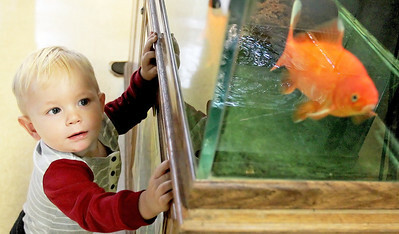 Candace H. Johnson-For Shaw Media Wyatt Kustra, 1, of Cary looks at a goldfish during the Oaktober Celebration at the Prairie Grass Nature Museum in the Round Lake Area Park District's Aquatic Center building in Round Lake. 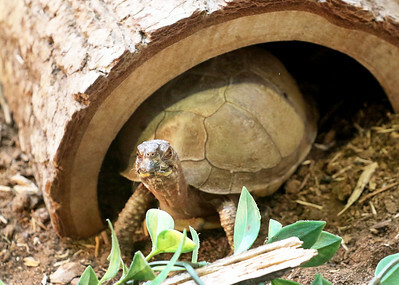 Candace H. Johnson-For Shaw Media Cupcake, an Eastern Box turtle, greets visitors during the Oaktober Celebration at the Prairie Grass Nature Museum in the Round Lake Area Park District's Aquatic Center building in Round Lake. 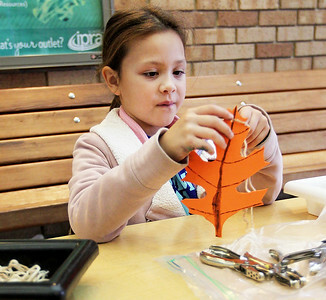 Candace H. Johnson-For Shaw Media Selene Quimby, 9, of Algonquin makes a foam oak door knob craft during the Oaktober Celebration at the Round Lake Area Park District’s Aquatic Center and Nature Museum in Round Lake. Selene is a volunteer with the Girl Scouts of Greater Chicago.